Located in the Haute-Loire region in France, the Etablissements Béal company designs and manufactures specialist chopping boards for its predominantly professional clientele under its Chabret trademark that was originally deposited in 1885. 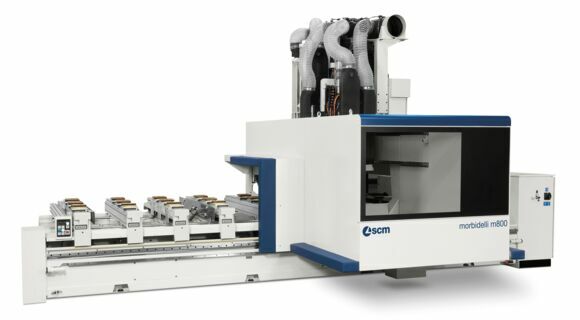 Continuing a tradition firmly founded on quality the company’s two current directors have recently succeeded in optimising their production department with two work centres (one of them a five-axis machine) made in Italy by the SCM. Sometimes it’s quite amazing how things work out, and that is certainly true for Cyprien Me - ynard, who was a training engineer up until 2007 when he discovered this very special product: the chopping board! “A year be - fore we opened our business, I didn’t know a thing about chopping boards,” he admits. Manufacturing on demand. Etablissements Béal’s two partner sawmills cut the wood into planks and dry it to between 8 and 15%, when the board is destined for use on a butcher’s sales counter and between 18 and 20% if it has been ordered for the butcher’s workshop – the backroom where all the major cutting operations are carried out. 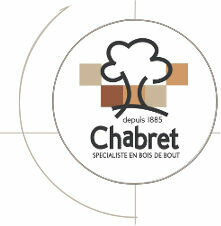 Of all the Chabret trademark chopping boards produced, only about 10% of them are made for workshops. “Between 60 and 70% of our production is specifically made for a clientele of profession - als, whereas the rest is bought by private parties or shops,” specifies Cyprien Meynard. Nevertheless, Etablissements Béal, whose production organisation is based on a dynamic, or rather, local tradition also boasts nationwide visibility. “We operate at a national level via dealers,” ex - plains Cyprien Meynard. “There are only three or four in France, but we have also had to face foreign competition from both Italy and Eastern Europe. These European manufacturers use mainly beech and some acacia. Our produc - tion, however, as well as being awarded the “Entreprises du Patrimoine Vivant” label, has also been certified with the NF Hygiène Ali - mentaire (Food Hygiene Standard) trademark and we are the only ones to have this certifica - tion.” This is important as hygiene is a factor that should not be forgotten in the chopping board sector, given that wood “absorbs up to 97% of bacteria, whereas plastic simply stores it,” explains Cyprien Meynard. 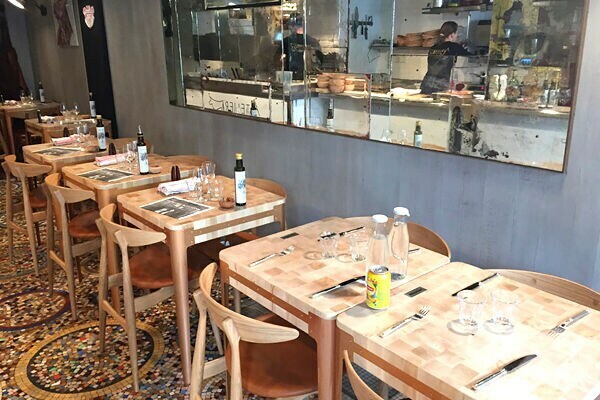 “On average, a professional butcher needs to change chop - ping board every 7 to 10 years.” It shouldn’t be forgotten either that in 2012, Etablissements Béal became a member of the “Ateliers d’Art 48 ETABLISSEMENTS BÉAL - FRANCE de France” (French Art Workshops). Two complementary work centres. “When we started up the business, there were only three of us,” recalls Cyprien Meynard. “But in the years that followed we became increasingly well-known and at one point we even had thirteen employees. There is no escaping the fact, though, that thanks to the industrialisation of our production tools, turnover is now higher, even if there only ten of us. It’s difficult to find people who are really committed,” he adds. “We choose young workers who have experience as cabinet-making carpenters and we train them for between two and three years”. In 2010, Etablissements Béal bought its first SCM work centre, a 4-axis Record 100 model. “We hadn’t planned on opting for this type of investment a priori,” explains Cyprien Meynard, “but given the company’s growth, which is based above all on our know-how, we said to ourselves: why not?” The 4-axis Record 100 is a compact, hi-tech work centre fitted with a work table that allows double profiling tool machining, as well as reducing tool changeover times and significantly increasing productivity. It has quickly become a machine the company can’t do without,” notes Cyprien Meynard, “as nearly all the chopping boards pass through it. 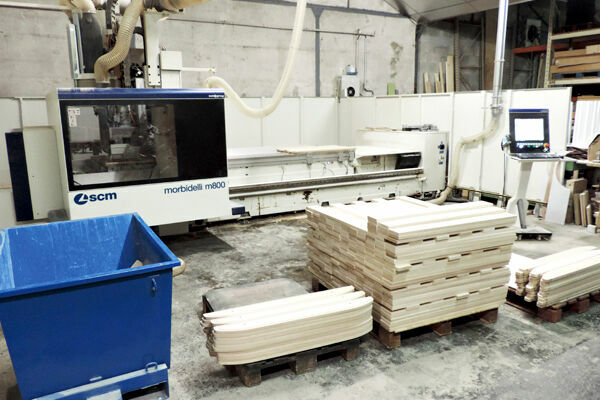 It is a machine that guarantees greater precision, less manual work and increased safety, so it also means we can think about investing in new markets.” In addition to the 4-axis Record 100, a year ago Etablissements Béal invested in a second SCM work centre: the 5-axis morbidelli m800 (pre-rebranding author m800). This faithful ally guarantees reduced maintenance, maximum versatility and an optimum quality finish. “With this large work centre we do everything we can’t do elsewhere, especially chopping boards with special shapes,” comments Cyprien Meynard. “Having a fifth axis is a significant advantage because it allows you to use less tools. Compared to a 4-axis work centre, there’s no need for an angular head, for example. Programming the machine is much simpler too.” Today the company operates with Maestro 3D software, a configuration that “allows us to plan work ahead and view machining processes as they are taking place.” In addition to these two work centres that the company’s production processes are now based around, the Etablissements Béal workshops also boast 4 side, planing, levelling and sanding machines, “even if,” specifies Cyprien Meynard, “most sanding operations are carried out by hand as the pieces are too heavy to load onto the machine”.